Picture this. A pie table. Every pie you can imagine. Which do you go for? Me? Well, I’m beelining it to the chocolate silk pie. 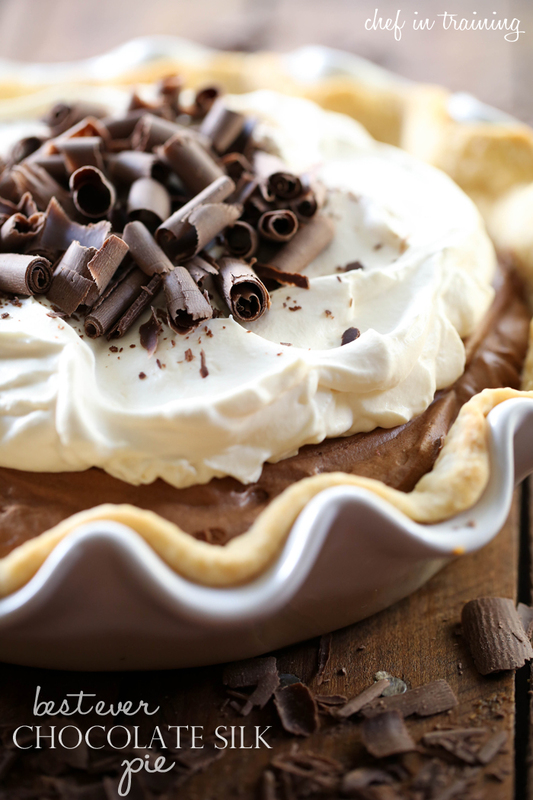 This recipe is really the Best Ever Chocolate Silk Pie… it is perfection! Rich, silky, creamy, chocolate heaven! The next few weeks I am focusing in on some recipes that would be great additions to your thanksgiving menu. Every day, a new recipe. So be sure and tune back in to the blog each day to find some GREAT ideas! Pies, side dishes, main dishes, desserts… you name it, you will be finding it here. To kick it off, we are starting with this pie. It is a complete show stopper. If you love pie, if you love chocolate, if you have a crowd of people who love one or both of those two things- then this is an absolute must! **As a word of caution, this recipe does contain raw eggs. Raw eggs always pose the risk for salmonella so make sure you use fresh, refrigerated, clean, high grade and pasteurized eggs to reduce the risk. Pregnant people, older folks, young children, babies and people with compromised immune systems are at a higher risk for getting salmonella. Pour into cool baked pie shell and evenly and carefully spread over pie. Cover and chill for 1-2 hours. Before serving, make Whipped Cream. Garnish with curled chocolate and cover and chill until ready to serve. I went the easy route and made my chocolate curls by shaving off chocolate from a giant chocolate block with my potato peeler. I even had some chocolate shavers, but actually preferred the potato peeler curls to those. As a word of caution, this recipe does contain raw eggs. Raw eggs always pose the risk for salmonella so make sure you use fresh, refrigerated, clean, high grade and pasteurized eggs to reduce the risk. Pregnant people, older folks, young children, babies and people with compromised immune systems are at a higher risk for getting salmonella. Oh my! I am drooling like a baby! This pie is beautiful! I am sure it taste even better! Nothing compares to chocolate silk! Looks yummy! Just curious...if I use a frozen pie crust, do I go for deep dish or regular? I recently made a French Silk/Chocolate Silk pie and I seriously had to give it away because it was dangerously good and yours looks the same! It's just gorgeous and I love that you're focusing on some pre-Thanksgiving/holiday recipes. Can't wait to see what you come up with! Pinned! Can you use cool whip instead. I have made this recipe for years. It doesn't seem possible but it is BETTER than Baker's Square! We love Chocolate Silk Pie at our house. I just posted how my daughter requested it for her birthday "cake" last week. My son is allergic to eggs.....what could I replace the eggs with ? Mmmm, your pie looks fabulous! Where is your pie pan from? Another name for this pie should be icing pie. Way too sweet. Wont be making it again. You actually finally posted a recipe that wasn't started from a box!!! Feels good to cook entirely from scratch doesn't it? That is a completely tacky comment. SMH. I agree not a very friendly comment. It is pretty condescending if you ask me. Probably not as good as making a snarky comment on a blog. But I'd imagine you'd know more about that than anyone else. We all get it, you're unhappy with yourself and don't know how to deal. No need to make it so public. Is it safe to have raw eggs in the pie? Mine turned out grainy. I've researched similar recipes and they call to beat sugar and butter for 10-15 minutes. Hope this helps someone out. I was very disappointed. Taste was great but the grainy taste ruined it for me, others thought it was good. This pie looks amazing! I make one every year for Thanksgiving and it's one of my favorites. I might just have to try this recipe this year. Thanks for sharing! Would love to try this but there are no pasteurized eggs within a 50 miles of my home. I highly recommend this recipe i made this pie yesterday and it was so delicious i will definitely make it again. Not the "BEST EVER". Chocolate was grainy. I beat it for 35 minutes. As a last resort I added 2 TB melted butter to hopefully resolve. It helped some. I googled and apparently not uncommon with choc silk pie. One suggestion was using castor sugar. (Expensive to buy, but can easily be made with food processor and regular sugar.) Should have researched the recipe first. Expensive pie and waste of money. Unfortunately, I didn't follow my own baking rule which is to never make anything new for company. Wouldn't make again. Followed the recipe to a T. Turned out fabulous!! Not grainy at all, and not too sweet. It was perfect. It was gone in under 15 minutes!! Just made this for Thanksgiving. Followed your directions exactly and the pie turned out perfect! The filling is so decadent and creamy! Thanks for the great recipe. Can you please explain what a "PASTEURIZED" egg is? We have our own hens so I don't buy eggs.